On a rare sunny and slightly warm day I decided to mount Roci and go for a leisurely ride down to my favorite park in Ciudad Real, Parque del Pilar. I’d noticed on previous visits to the park that there was a sizeable bar / restaurant near the center, but I’d never had the good fortune to find it open. At least, not until today. So, I parked Roci, headed to the outdoor bar and ordered a glass of wine. 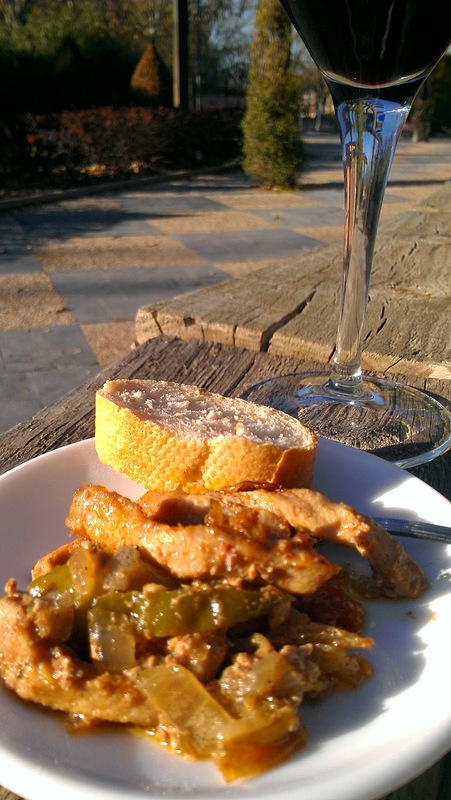 With my first glass came a simple but fairly tasty tapa of chicken stewed with onions and peppers. Not a bad start. And the little bit of sauce on the plate was quite nice when ‘sopped up’ with the bread that came alongside the tapa. I decided to order a second glass… you know, for research purposes. This glass was accompanied by a decent portion of deep fried chicken strips that had a slight coconut flavor and a little bit of a balsamic glaze drizzled on the plate. With the unseasonably warm weather, the mild taste of coconut seemed just right, and, for a moment I imagined that I was in some more beautiful, more tropical location than a park on the south side of Ciudad Real. Service at Meson Las Brasas was quite good. 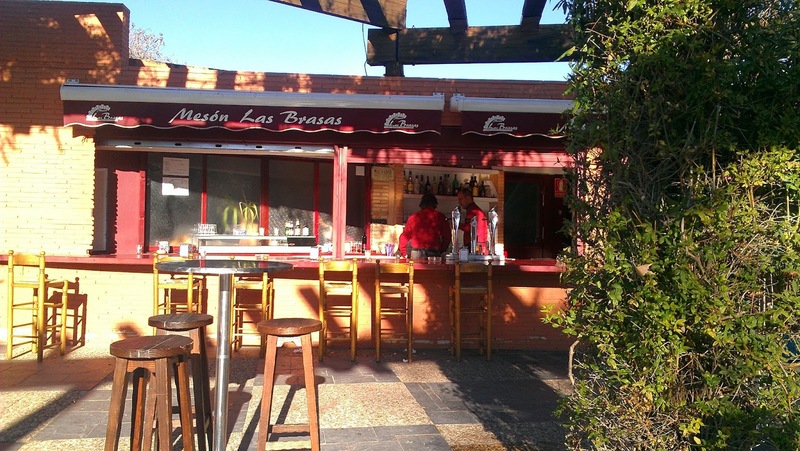 The bar staff was friendly and attentive – not something I’m used to at Spanish eateries. Due to a private event, I wasn’t able to see the inside of the establishment, but with the huge patio that lets you look out over the park and soak up the sun, I doubt I’ll ever want to see the inside. I have a feeling that this place might be in regular rotation once warmer weather is here to stay. Average Price per Tapa: Free tapa with drink. Glass of wine set me back 1.50. My Rating: Great service. Amazing patio. 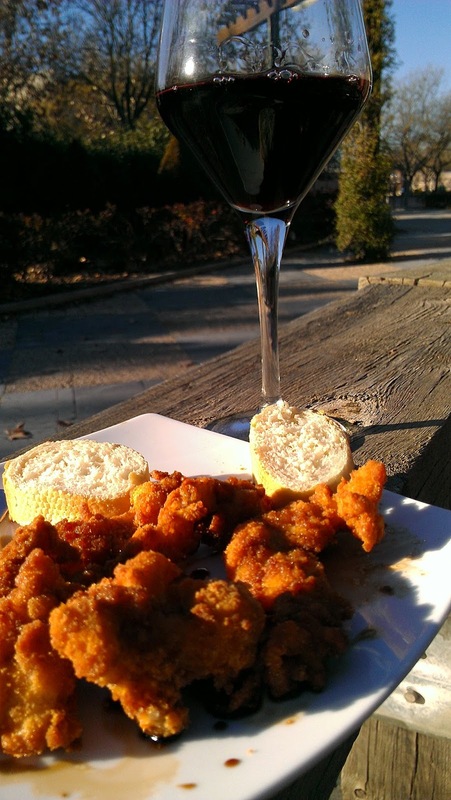 Quality wine and decent tapas.